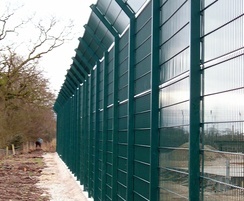 Demountable perimeter fencing was required to secure underground gas chambers at an EDF Energy site in Cheshire. The site near Crewe incorporates 11 large gas storage chambers 200m underground, each of which can store around 36 million therms. One therm is the equivalent to 30 kilowatt hours (kWh) of energy. For this project, Zaun Ltd supplied more than 500m of its 2.4m-high Duo8 steel mesh fencing panels. 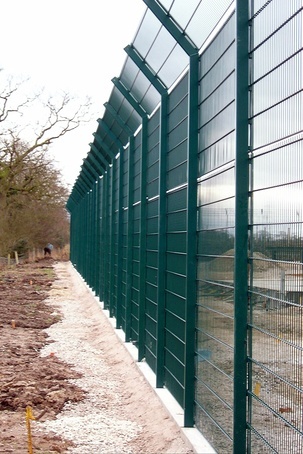 Duo8 is a twin-wire fencing panel featuring two 8mm horizontal wires that sandwich 6mm vertical wires, which provides a good-looking perimeter that is strong and rigid enough to secure a site from potential trespassers, vandals and thieves. Each panel for this project also incorporated a 600mm crank above, and sits on fencing posts slotted into sockets, allowing the fence line to be demountable. The panels were manufactured with a 50 x 200mm open mesh aperture, which is ideal for use with CCTV camera systems as this provides excellent through visibility. Zaun provides security fencing extensively across the utilities sector and for other sites of critical national infrastructure.